Thanks to guide Steve Crummay from Explore in Cornwall, we made it out to four additional sites before leaving Cornwall. This is Men-an-tol, which means hole in stone in Cornish. Seems that over time the stones were arranged differently and this holed stone was not only horizontal, it wasn't even a hole, just a bowl to hold water. But isn't it cool anyway? 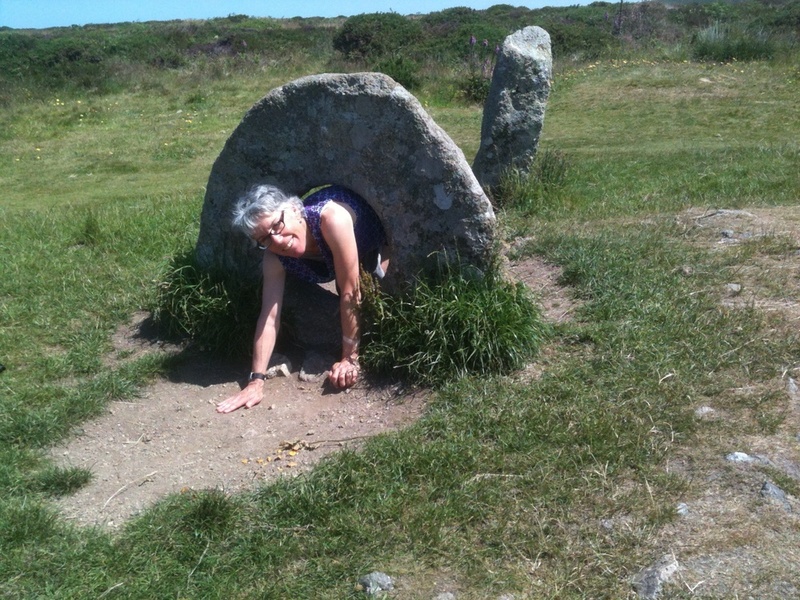 After seeing this, we hiked another 30 minutes up to Nine Maidens, a beautiful stone circle with views all around, including ocean on both sides of the Penwith Peninsula. The largest stone circle in Britain, Avebury was all that I hoped for. The last time I was here was in 1969 while on a family trip and I did remember it, but somehow had forgotten the magnificence of the individual stones. They are all different with distinct characters, and all complete sculptures in themselves. My favorite part was walking the outer earthwork which rises higher than the stones. I liked the worn path with glimpses of white chalk peeking through. I liked the silky grasses blowing in the wind and lit up in the sunlight. It is growing season all around and even within the circle. The farmers had just mowed the day before we arrived and the hay lay drying. I was also so aware of the surrounding landscape, gentile hills covered with barley, hay, and wheat. It is human scaled; small villages, narrow roads, footpaths, farms. A landscape that has been shaped and loved by humans for millennia. Avebury is one of thousands of sites built by people over thousands of years.